Roads get hot in the sun. The French have realised that Energy solutions are beneath our cars! Les rues de soleil! Fossil fuels are clearly causing a serious environmental disaster. The evidence is overwhelming. Even if you disagree, the use of renewable energy has to be preferable. Have you ever walked along a road at 2pm … mid-summer … barefoot? It can hurt if you are in a half-decent summer! Our roads are increasingly occupied and equally congested at times. They do, however, have a new job. Multi-tasking may well be beyond us males but thankfully La Rue is feminine. 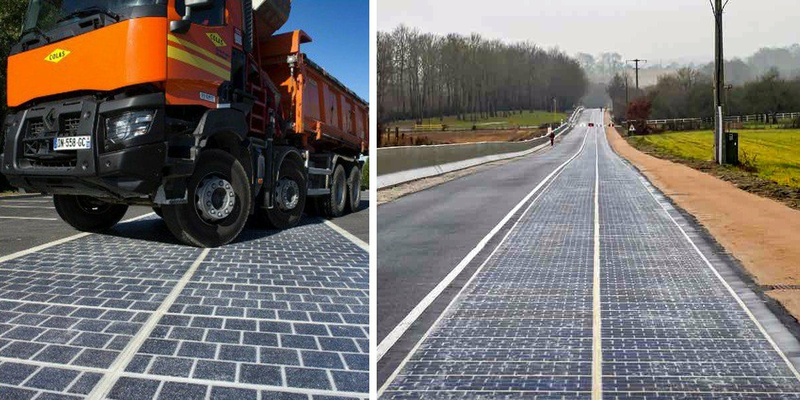 The French have built a stretch of prototype road which doubles up as a solar energy producer. Similar projects are planned in the USA. Tourouvre-au-Perche in Normandy, France has the world’s first solar road, nicknamed Wattway. It is a one kilometre stretch of road covered with 2,800-square-meters of resin-encased panels. The French Ministry of the Environment invested €5 million (just over $5million) to build the project, which opened in December 2016. The French are conducting a test period of two years to see if the project can generate a sustainable energy source. The panels consist of extremely thin yet durable panels of polycrystalline silicon which transform solar energy into electricity. The panels are designed to withstand all types of traffic, including heavy-duty vehicles and in terms of efficiency, are only slightly lower in yield to conventional photovoltaic panels. The French government plans to eventually pave 1,000 kilometres (621 miles) of its roads with solar panels. If the project is a success, I see no reason why this should not increase. “The maximum effect of the program, if successful, could be to furnish 5 million people with electricity, or about 8 percent of the French population,” claims the government. Critics, however, have concerns over the high price of the project. The first solar panels were equally exorbitant and far less efficient. “It’s without doubt a technical advance, but in order to develop renewables there are other priorities than a gadget of which we are more certain that it’s very expensive than the fact it works,” is the cynical riposte. Jean-Louis Bal, president of renewable energy union SER, added, “We have to look at the cost, the production [of electricity] and the economic lifespan of the installation. For now I don’t have the answers.” How very … enlightening! Colas, the company responsible for the project, said that expenses will eventually lessen as the technology is adopted elsewhere in the world, including an experimental site that launched earlier this month in the U.S. The site consists of of 50 square metres of Wattway solar panels installed at the Georgia Visitor Information Center in West Point, Georgia. While solar roads have its detractors, the technology has been touted as an efficient way to harness the sun’s energy while taking advantage of the world’s expansive roadway network. Bitumen has also risen enormously in terms of installed cost.